A rigging harness separate from the stand – the only component to carry aloft. Constructed of a Cable/Black oxidized chain combination that secures with an “S” hook. Durable, weatherproof (& squirrel-proof!) neoprene disks provide a space between the tree and the cable for insertion of the patented, easy starting, wedge-shaped attachment projections, enabling rigging in the tree in less than 15 seconds. 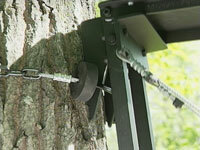 Leveling feature allows a safe, level comfortable deck, even when rigging on trees angled up to 15 degrees. Extra harnesses may be purchased for multiple-stand locations. Lined with neoprene rubber tread and industrial rubber bumpers which cradle the tree safely and silently while providing an extremely stable platform. 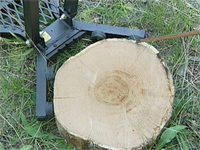 The saddle rests against the tree, safely cradling the tree no matter what the diameter (from 5″ up to 18″), without causing any tree damage.